I am offering this information again in case anyone missed it the first time around. If you saw it and are not interested, skip to Quick Takes #2. I beat my personal best for my walking group this week. Not a huge improvement over my last personal best, but it still takes quite a commitment to walk this much in a day. We are in our second month of the competition, and I was thinking maybe I would try to beat my personal best once a month or so. I am not that motivated to try and beat it once a week. Not yet at least. While my mother-in-law was visiting last weekend we spent some time and switched my living room and dining room. It works so much better and I am amazed that I didn't think to do this before. When we toured the house the rooms were switched but it never occured to us that it would work better for us like that as well. We only have to walk an extra four steps to get food to the table. It really adds up to no extra effort. Take another look at the photo right above this. See that gorgeous piece of furniture commonly known as a sofa? WE HAVE A NEW SOFA!!!!! We have never owned a brand-new sofa before and we have never owned a sofa that has been selected because it would look great in our house. We have loved all the "new to us" sofas we have owned, but this sofa is new to everyone. Another big bonus of having my MIL here! Michael and I have been discussing the quanity of physical possessions we own. Like many others, we feel owning an abundance of stuff is really a burden. Take the above photo, for example. We know there is too much furniture in that room. There was too much furniture before we added the new couch. The room looks cluttered and I feel tired by walking into it. Michael and I have been examining our lives through this lens and determining what areas of our house and what stuff is "pulling us down." We are never without things we need, whereas we have many things we keep "just because." Others can be blessed by things we don't use. Yeah, now I'm just using up the takes so I can go to bed. 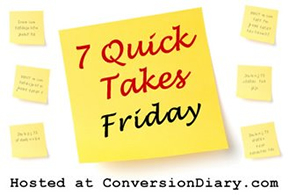 Join Jen over at Conversion Diary for more Quick Takes. LOVE the sofa! We are hoping to get a new sofa sometime in the near future. The sofa looks great, your living room looks so inviting. The new sofa looks great. Every so often I revisit the 'we have too much stuff' conversation. I think it's good to stop and look around and take inventory of what I have, don't need. It is so nice after five years to have a place to sit on the first floor. Not just the new sofa, but the room as a whole!